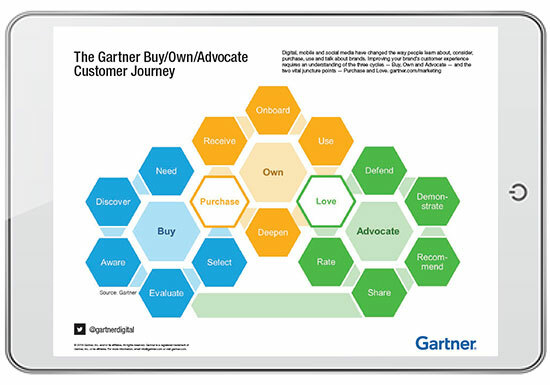 Gartner for Marketers: Buy. Own. Advocate. Repeat. The customer journey is changing. This new vision uses metrics and collaboration to move buyers beyond purchase to love and advocacy. How to Align Customer Experience With Marketing Channel Operations gives you a strategic approach to mastering the new customer journey. Gartner for Marketers connects you with experts who will advise you in the digital marketing areas that matter most — so you can plan, manage and execute a successful digital strategy. To speak with a digital marketing advisor, contact us at 1.866.592.5144 or gml@gartner.com. © 2016 Gartner, Inc. and/or its affiliates. All rights reserved. Gartner is a registered trademark of Gartner, Inc. or its affiliates. For more information, visit gartner.com/marketing.